Do the math! 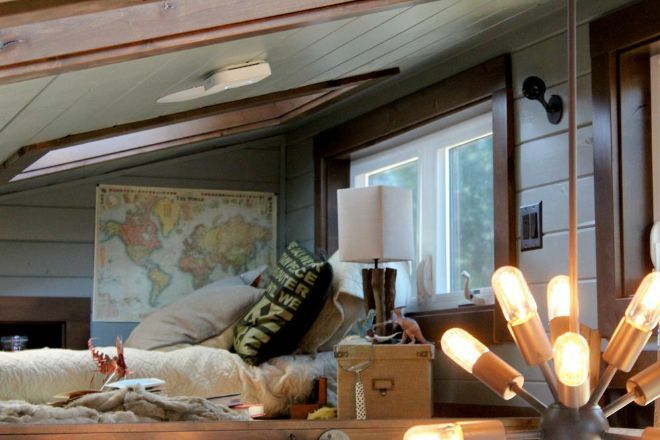 This 33-ft. long tiny house sleeps five! 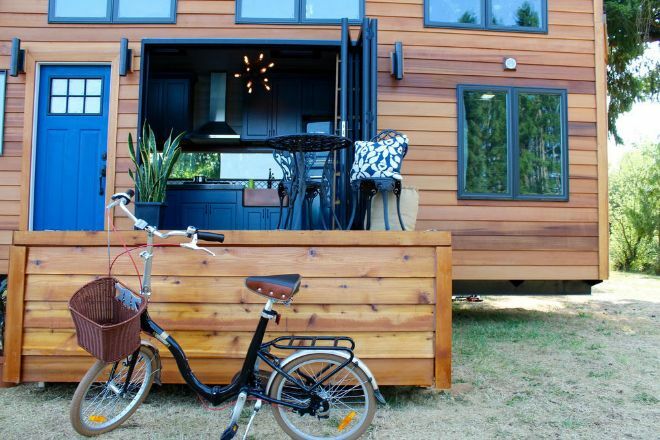 Tiny Heirlooms Inc., of Portland, Ore., admits that the tiny house project, which they aptly named “Luxurious,” was a bit of a design challenge. 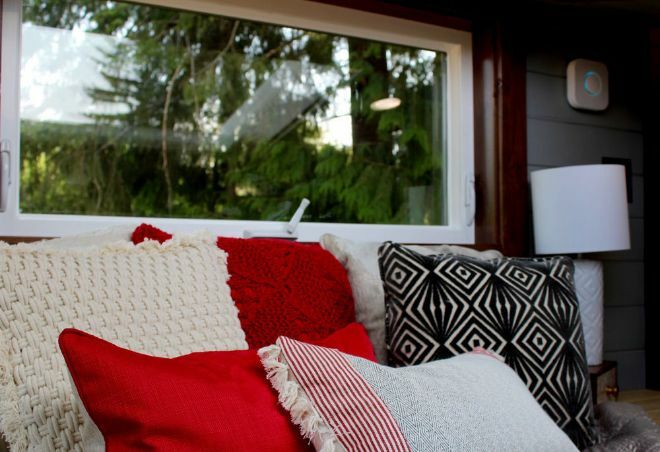 The challenge was not building a sense of top-shelf style into this tiny house. The builders were clearly up to that challenge, as you shall see. 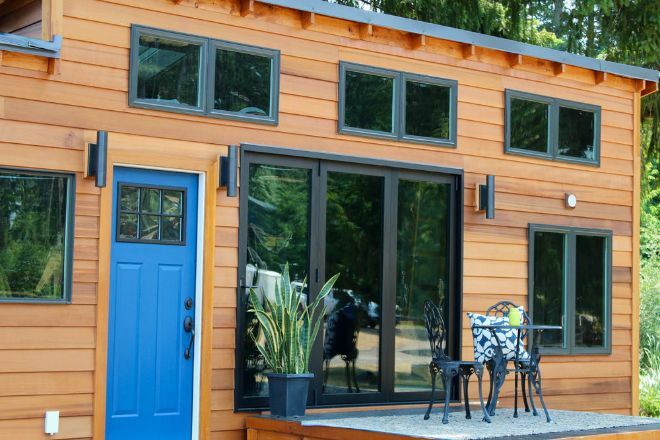 But this tiny house was a custom order in which the company was tasked with building a 33-feet long house on wheels that would accommodation a family of five! That would be two grownups, three kids and maybe even a hamster or two. How did they do it? The answer is moving walls. Depending on the positioning of the walls, the house can have an extended living room or sub-divided bedrooms, which include a set of bunk beds that fold up against the wall when not in use. And they still had the temerity to call this home "Luxurious." Well, see for yourself. The results are ingenious and luxurious. Let's have a look. You can already see this house has a luxurious number of windows and doors -- five windows and two doors on this side of the house alone. Later, you will see this house also has two terrific skylights right above the two sleeping lofts. The view above shows the glass doors, when they are open. 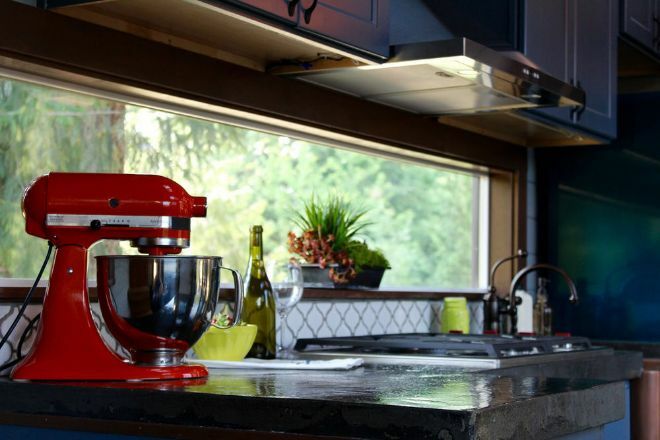 The design qualities are so refined on this house, that the window trim and the door color matches well with the color of the kitchen cabinets. If you want to add a sense of luxury and modern styling to a home, this ceiling lamp will fill the bill pretty well. Behind it is one of the house's skylights. The windows on the back side of the house, like the one above and the kitchen window below, are horizontal. 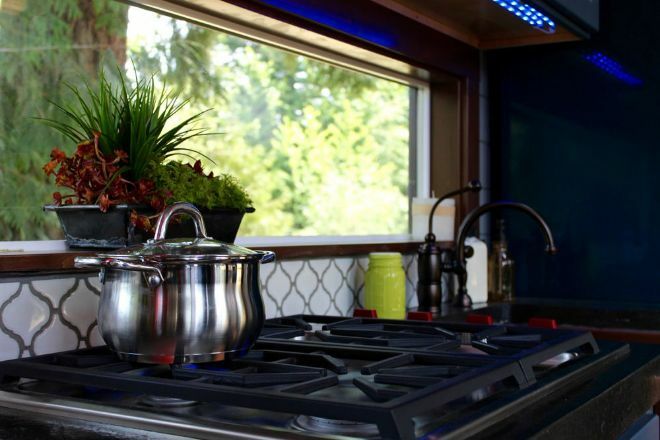 A close up of the kitchen stove shows the quality of this home's appliances. The tile work under the window is a terrific touch. 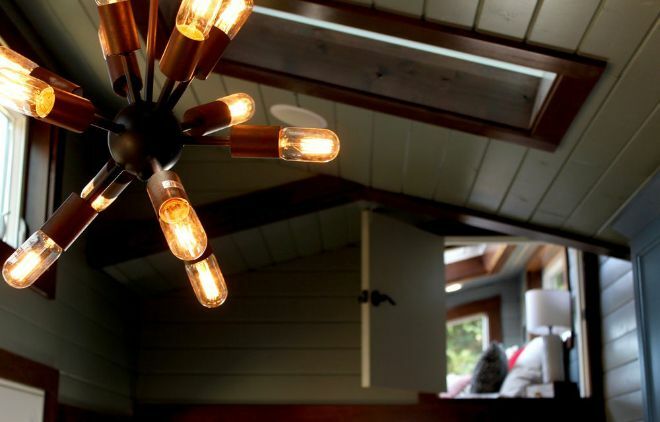 One of the bedrooms above with a funky lamp that matches the ceiling fixture. This room (at least from this angle) looks cozy, not cluttered. You can also get a feel for how grand that skylight would be on sleepless nights when you want to contemplate the cosmos. 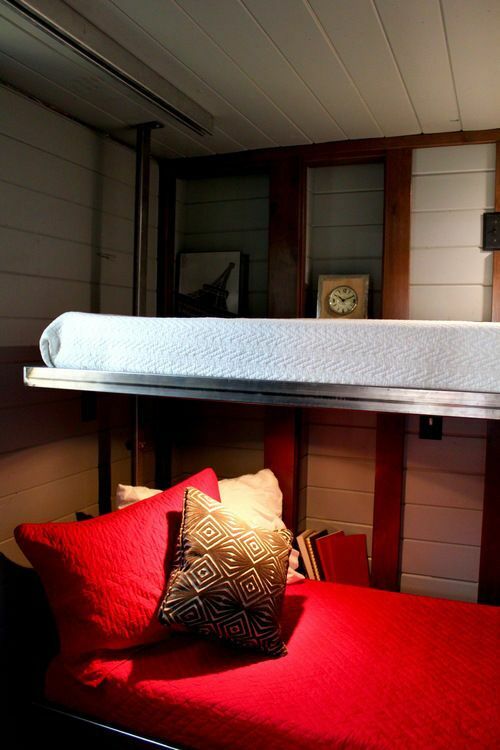 Here are the two bunk beds that fold up against the wall when not in use. Furthermore, although it is hard to demonstrate in a photo, this is the wall that slides backwards, allowing for a larger living room when nobody is using the bunk beds. 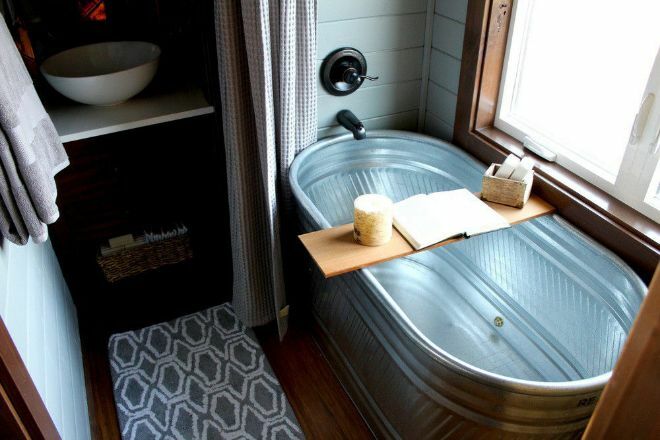 Last but not least: That's not the most luxurious bathtub in the world, granted, but it's deep and roomy and holds plenty of water. 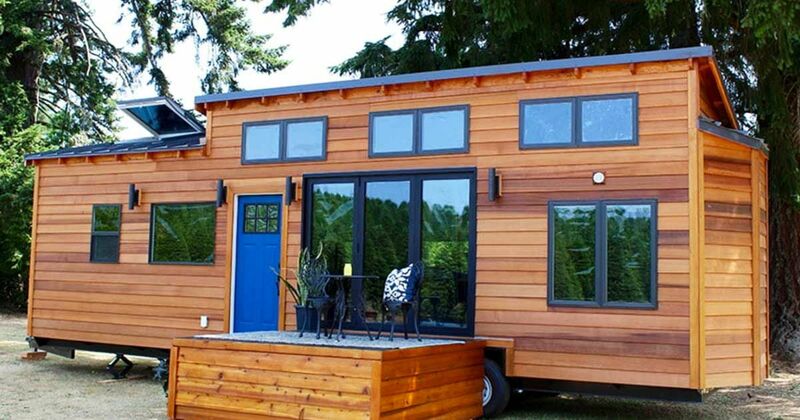 That's pretty splendid for a tiny house that sleeps five.